This unique ring is made of 316L stainless steel and features a fully cast and enameled team logo. In addition to the attractive look of this ring it also includes a functional bottle opener feature. Opens any pop top beverages. Chicago Cubs Ring - Size 9 (more info) — only 2 left! Chicago Cubs Ring - Size 10 (more info) — only 1 left! Chicago Cubs Ring - Size 11 (more info) — only 2 left! 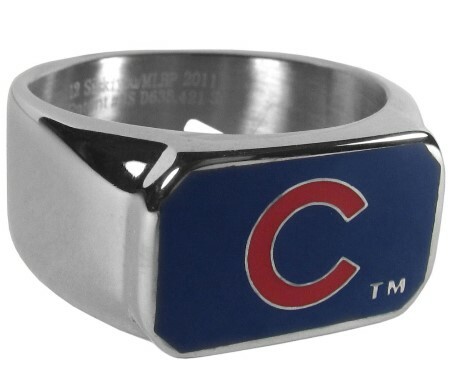 Chicago Cubs Ring - Size 12 (more info) — only 2 left! Chicago Cubs Ring- Size 13 (more info) — only 2 left!